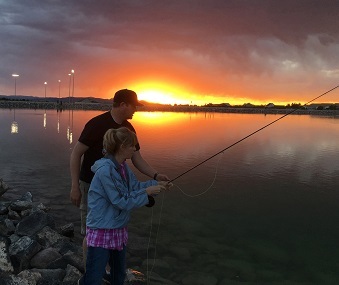 Cedar City -- If you're 12 years of age or older, you can learn the basics of fly fishing-and then practice your newly learned skills-at a free clinic on May 25. The clinic runs from 6 - 9 p.m. at the Cedar City Aquatic Center. The center is at 2090 W. Royal Hunte Dr. in Cedar City, just across from Cedar Middle School. The clinic is limited to the first 75 people who register. You can register at http://bit.ly/fly_fishing_clinic. If you attend the free clinic, Heather Talley, regional wildlife recreation coordinator for the Division of Wildlife Resources, says you'll learn the basics of casting, including the different types of casts you can use while fly fishing, fish identification and feeding preferences, and when to utilize various types of flies. "Sportsman's Warehouse will also give you a ticket you can take to their Cedar City store, for a chance to win a prize," she says. Sportsman's Warehouse, Sportsmen for Fish and Wildlife and the DWR are offering the free event. Talley says experienced fly anglers will teach the free clinic. "When you arrive that evening," she says, "just come in through the main entrance, and we'll direct you to the classroom for the first session of the clinic." Talley says classroom instruction will last about an hour. "After the instruction," she says, "you can ask questions at a question-and-answer session. Then, you'll have a chance to head outside and-with the help of an instructor-practice the skills you've learned. If you have a fishing license, you can cap the clinic off by heading to the Lake at the Hills community fishery, next to the Aquatic Center, to try to catch a fish." For more information about the clinic, visit http://bit.ly/fly_fishing_clinic or call Talley at 435-868-8756 or 435-865-6100. Some portions copyright Utah DWR. Used with permission.